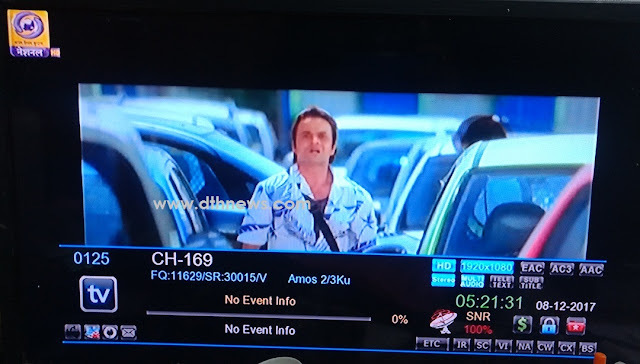 DD Free Dish is India's first FREE DTH service now testing its first HD channel on its DTH platform. DD Freedish added "DD National HD" channel on DVB-S2 frequencies. DD National HD channel is also available on TATA Sky platform. If you have free-to-air HD set-top box then you can tune this channel in high definition quality. DD Freedish providing large numbers TV channels without any monthly subscription. Although, the number of HD channels on private DTH platforms is far less than that on paid platforms. Tata Sky has around 90+ HD channels, Airtel Digital with around 70 and Dish TV and Sun Direct with around 80 and Videocon D2H has about 80+ HD channels. But bad news for “DD Free Dish iCAS set-top box subscribers”, because this high definition channel will not be available in iCAS set-top boxes. As of now DD Free Dish iCAS set-top boxes are available in MPEG-4 technology only, and not upgraded yet for high definition TV channels, also you cannot watch other satellites FTA channels in iCAS set-top boxes due to its software limitations. So simply buy non-iCAS set-top box to enjoy all TV channels, so you can install free DTH system using a free-to-air HD satellite receiver and a 55cm to 75cm ku-band dish antenna that has to be pointed to the GSAT 15 satellite placed over the 93.5 degree East position. While another FREE DTH service ABS Freeview also providing one free-to-air HD channel "Trace Sports HD" on its platform. ABS Freeview DTH is carrying about 80+ national & international TV channels. You can also tune this satellite if you have a high defination set-top box and dish antenna system. You need to relocate your dish antenna at 75 degree east position.